Welcome to the fourth of a six part series of essays focusing on Katherine Kurtz's Deryni novels (you may find the first, second, and third parts here). As I am physically incapable of actually reviewing these novels with any semblance of objectivity because they've imprinted themselves deep into my heart, what I am going to do instead is write about the aspects of each of the "Camber Era" novels which have stuck with me throughout the years and which I find intriguing today. Shall we continue? "I do not pray for a conversion of the Deryni," Secorim muttered through clenched teeth. "I pray for their destruction!" "And I pray for deliverance from their influence!" Javan retorted, knowing he must defuse that line of hatred immediately, or all was lost. "I pray for deliverance, and today my prayer was answered." We have not forgotten the massacre near the end of Camber the Heretic and just how bad life in Gwynedd has been for the Deryni living there. 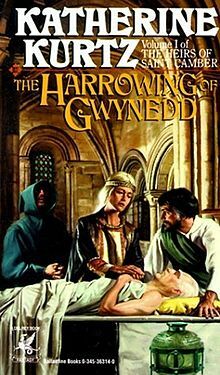 The title The Harrowing of Gwynedd should be quite enough to realize that things are not going to get better any time soon. Also, readers of the Kelson era novels know well enough how many hundreds of years for uneasy inroads to be made. For now, we are still in the early days of the persecution of the Deryni race. With Cinhil dead, his underage son Alroy is on the throne of Gwynedd and under the control of the human regents who are far more interested in consolidating their own power and destroying the Deryni as completely as possible. There are few moments of grace here. Instead, what we have is a pervading sense of numbness. The regents have their "pet" Deryni collaborating under extreme duress against their own race and doing the bidding of their masters. We have the state sponsored murder of Declan Carmody's wife and children done in front of him and his subsequent torture and and execution (though, he dies during said torture). We have the scourging of Javan for defying Archbishop Hubert. We have the creation of Custodes Fidei, the new religious order permitted to have soldiers of the faith as well as the responsibility for all religious instruction in Gwynedd - which doesn't sound terrible on its face, except that they are also given "automatic forgiveness for malicide", which essentially grants these soldiers of God "the license to murder Deryni". Yeah, they're friggin delightful (and they will only get worse in the next two books). I don't have a strong memory of this book and what I do remember is that this is Evaine's book, but that's only half of the story. There are two parallel stories told in The Harrowing of Gwynedd. One storyline is Javan back at the capital trying to find a way that he might be able to survive and thrive and provide information and access to his Deryni allies and friends. It is everything he can do to hide his hatred and disgust of what the regents are doing. Javan, being one of the three sons of Cinhil, has begun to develop magical powers - powers which should by rights only be developing in Alroy as King, but perhaps because Alroy is spending his days drugged into submission by the regents Javan is instead the beneficiary. With those powers, we get back to one of the concerns I had with the previous three novels I wrote about it. In this novel we see Javan invade the mind of Hubert MacInnis and set magical compulsions to both guide and force Hubert into actions and behaviors he would never have considered on his own. Now, let's all acknowledge that Hubert is flat out evil and an example of a churchman whose every action is at utter opposition to the religion he is supposed to follow and, in fact, lead as Primate of Gwynedd. Previous novels gave many examples of true men of faith trying to follow the teachings of the church and live lives in imitation of Christ. The Harrowing of Gwynedd shows the other side of that coin, giving examples of men using the church to further their own aims. So, when Javan uses his power on Hubert we see it as a good thing, an opportunity to mitigate the evil Hubert is planning, an opportunity to protect himself. But, this is also the very sort of action that causes humanity to hate and be fearful of the Deryni. Though Javan is not Deryni, he has their powers, and he is using it in the same way to take control of Hubert, to take control of random guards, and to demonstrate to everyone that Deryni can do what they want to whomever they want. Javan is one of my favorite characters, but the older I get the more I can see the cracks in the armor of the "virtuous" Deryni heroes. We read these books with the Deryni and the friends of the Deryni has heroes and as the persecuted minority - which they are, but even the good guys are doing ethically questionable stuff that we don't question because they're the good guys. But let's move on to the part of the novel which I so clearly remember. This is the volume where Evaine truly comes into her own and set such a mark on me that until my re-read of the first three Camber era novels I had thought she played a significant role, and she doesn't. But here, almost freed of the shadow of her dead father, she comes into her own and steps into a significant leadership role of the Camberian Council and is the major player of this novel, along with Javan (who I remembered having a much lesser role than he does). I said that Evaine is almost freed of the shadow of her dead father, and that's very accurate because her driving motivation for this novel is to research the magic required to return her father to life (she thinks he may be trapped between life and death). So, while she is a powerful character here, her actions are all still on her father's behalf. Where Evaine is at her best, though, is in the depth of the research into the spell to help her father. She shines as a researcher delving deep into deryni magic and lore - which gets to the heart of one of my favorite aspects of the Deryni novels. I love the heritage Kurtz reveals. I'd just love to see more of Evaine with the Council and how she helped develop the next generation of Deryni and her Healer children. Alas. Had Evaine lived though this novel and into the next thirty plus years, I can only imagine the things she would have discovered, learned, and passed on about long lost and newly found aspects of magic. Instead, what we get are glimpses. Here Evaine discovers the tomb of Orin and Jodotha, two legendary Deryni mystics. She is on the cusp of such great discoveries - but her focus is on restoring Camber to life, a man who had lived at least two lifetimes in his day. I want to know so much more about Orin and Jodotha (there have long been rumors Kurtz will write that novel, too), the Airsid, the dark times of the "barbarian incursions, the failure of the Pax Romanum, the cost of the Moorish repulsion". I'd love a deep dive into Deryni history. We never quite get that anywhere else in the series. Next up is my introduction to Katherine Kurtz and the world of the Deryni: King Javan's Year. Sometimes I start fairly deep into a series and still get hooked.